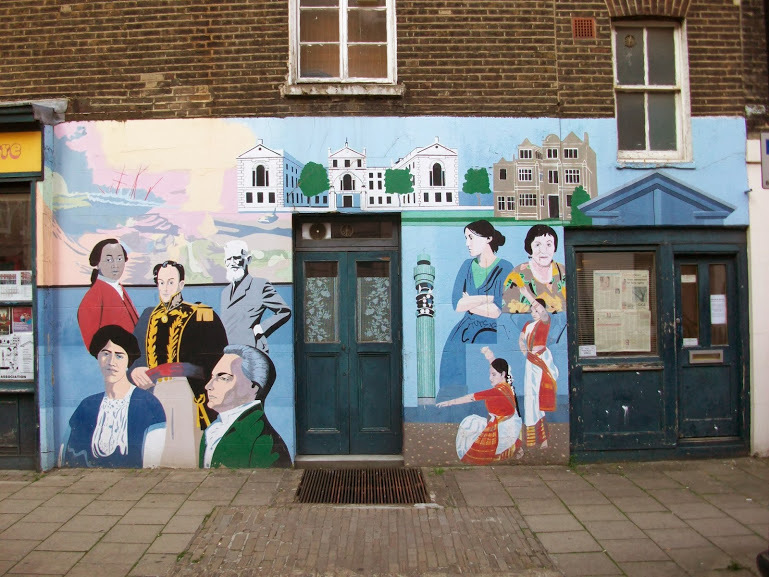 Mural on Fitzrovia Neighbourhood Centre on the corner of Goodge Place and Tottenham Street. Designed by Brian Barnes MBE it was painted by local children in 2000. It features Olaudah Equiano, Marie Stopes, Simon Bolivar, George Bernard Shaw, Virginia Woolf, and Cynthia Williams. Also depicted are images of slavers throwing the dead and dying overboard by JMW Turner, the Middlesex Hospital, Tottenhall Manor, BT Tower, and Bengali dancers. The Fitzrovia Neighbourhood Association was created to run the Neighbourhood Centre and to employ staff to carry out community development work including providing a free housing and welfare advice service. The Neighbourhood Centre, which was previously a glass shop, was renovated and opened in 1975. The Neighbourhood Association is well-known for its work with the local Bangladeshi community and in particular its art projects with Asian women, as well as work supporting older people. The Neighbourhood Centre went on to become a base for community activity where Fitzrovia News community newspaper was produced and where the annual Fitzrovia Festival was organised. Other community groups also used the Centre, in particular the Charlotte Street Association who were formed earlier in 1970. The centre provided meeting rooms, use of a photocopier, and in recent years access to the Internet. In the year 2000 a mural was painted on the Goodge Place wall by local children supervised by mural artist Brian Barnes MBE. In 2004 the Fitzrovia Neighbourhood Assocation became a registered charity. The 40 year celebration events will be based around Fitzrovia Festival which will be held over the second half of June 2015. The full list of events is here. This entry was posted in Uncategorized and tagged Charity, Fitzrovia Festival. Bookmark the permalink.